The global economic system is experiencing a profound period of rapid change. The emergence of globalised production and distribution systems, which bring together diverse constellations of economic actors through a complex regime of global corporate governance, state regulation and new international divisions of labour, demands corresponding and innovative explanatory models. 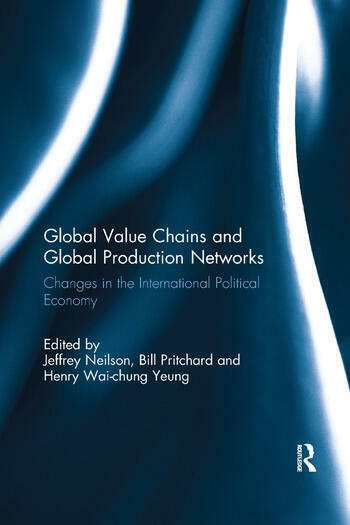 Global value chains (GVCs) and global production networks (GPNs) have been particularly useful as conceptual frameworks for understanding the global market engagement of firms, regions and nations. This book examines the rise of GVCs and GPNs as dominant features of the international political economy. It brings together leading thinkers in the field and sets out new directions for future scholarship in understanding the contemporary global economic system. In doing so, this book makes a significant contribution to our understanding of the international political economy and the global economic system in the post-Washington Consensus era of contemporary capitalism. This book was published as a special issue of the Review of International Political Economy. Jeffrey Neilson is Senior Lecturer in economic and environmental geography at the University of Sydney, where he researches economic development and natural resource management in Southeast Asia, with a primary focus on Indonesia. Bill Pritchard is an Associate Professor in human geography at the University of Sydney, where he specialises in agriculture, food and rural places. Professor Pritchard is interested in the ways that global and local processes are transforming places, industries and people's lives. Henry Yeung is a Professor of economic geography at the National University of Singapore. His research interests cover broadly theories and the geography of transnational corporations, global production networks and global value chains, East Asian firms and developmental states in the global economy.